In market such as Nyack where there is greater demand for homes than available buyers often put a bid in on a home and don’t get it. Obviously this is very frustrating and one possible solution is to include an Escalation Clause in your offer. 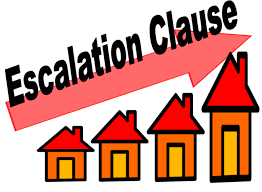 Simply put an escalation clause is a pre-established term in a purchase offer that increases the buyers original offer by a certain amount.Simply put if several buyer out bids in and a buyer with an escalation clause wasn’t high bidder his bid bid will now automatically go to high bid by a predetermined amount. Buyers should check with their agents as to which form to submit with purchase offer A poorly worded escalation clause can hurt the buyer. It is also important that the offer ceiling take current market prices into consideration if financing. The buyer wants to know that his offer price will appraise or he might not get the money to complete the purchase.